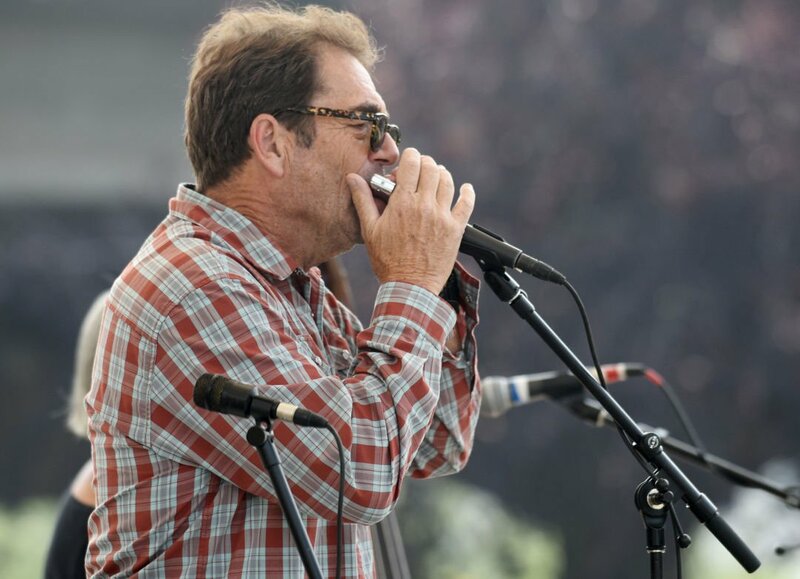 The crowd at the final Out to Lunch of the summer was treated to a surprise visit by rock legend Huey Lewis during the Big Sky Mudflaps’ set in Caras Park on Wednesday. Lewis performed four R&B classics with the group, playing the harmonica and singing lead. 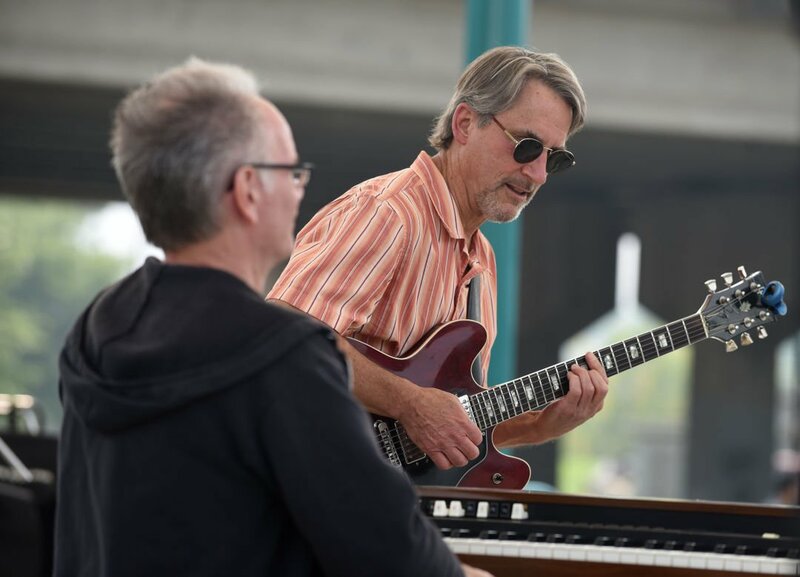 Big Sky Mudflaps guitarist David Horgan, right, plays guitar alongside Bob Packwood, on piano, at Out to Lunch on Wednesday. The crowd at the final Out to Lunch of the summer in Missoula was treated to a surprise visit by rock legend Huey Lewis during the Big Sky Mudflaps’ set in Caras Park on Wednesday. Lewis performed four R&B classics with the group, playing the harmonica and singing lead. The crowd at the final Out to Lunch of the summer was treated to a surprise visit by ’80s rock legend Huey Lewis during the Big Sky Mudflaps’ set in Caras Park on Wednesday. Lewis, who lives on a ranch outside Stevensville, and the group ripped through four R&B classics, including “Blue Monday,” made famous by Fats Domino. Lewis sang lead and played harmonica. The band members stood around with Lewis before they began their set, picking songs, joking and laughing. They shot down a couple of selections before settling on an order for the set list. Mudflaps guitarist David Horgan said they first met Lewis at a mutual friend’s wedding the band played in 1997. While he was unloading gear from the van, Horgan said he saw a guy in a suit walk up and ask if he needed any help. Horgan, confused by the stranger, turned around to answer and recognized Lewis. Lewis ended up joining them on stage. Wednesday’s set marked the fifth time Lewis has performed with the Mudflaps and at least the second time he’s performed at Caras Park. He joined Santana on stage in 1998 during his show in Missoula. Lewis, who was raised in California, moved to Montana in 1987 and lives in the Bitterroot Valley full time, between touring and other responsibilities. Joe Allred, Lewis’ ranch manager, was with him at Out to Lunch before they drove down to Stevensville. Allred was hired last December, after hearing about the job from a “friend of a friend of a friend.” He recognized the ranch owner’s name and took the interview. When Lewis resumes his tour in Tulalip, Washington, on Friday, Allred said he’s excited to travel on the tour bus to watch the show. Wednesday was the first time Allred had seen Lewis perform live. On stage with the Mudflaps, Lewis said the band had been together two years longer than Huey Lewis and the News and congratulated them on their longevity. The band only had nice things to say. “He’s been a good friend for a long time,” Horgan said. “He’s just a really good guy,” saxophonist Chuck Florence added.